A global leader, restaurateur and truly customer focused operator, Tyrone is the Chief Executive Officer for Alabbar Enterprises, a Parent Company of fifteen Retail and F&B brands operating across the UAE. 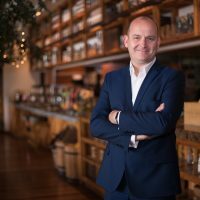 Bringing with him over two decades of F&B, retail and hospitality experience to his role, Tyrone has led over twenty world renowned brands. With an unwavering passion, he brings a unique blend of knowledge to Alabbar Enterprises through his experience gained across the UK, Middle East, Turkey and Russian markets. Tyrone has led and managed multiple businesses, brands, their launches and subsequent operations with a keen commercial eye and strong sense of pride in delivering best in class guest experiences and building great teams. Through his drive for customer service excellence, consistent growth and challenging the status quo, Tyrone has grown from his first proudly held role as a Commis Chef at The Gleneagles Hotel to subsequent managerial roles at Mitchells & Butlers, SSP, MH Alshaya, and more recently setting up Rise LLC in the UAE. During his time in the Middle East, Tyrone has held a number of high profile positions in the F&B and Hospitality industries including setting up and launching Shake Shack across the Middle East, UK, Russia and Turkey as well as launching Five Guys in the UAE. Presently leading fifteen brands at Alabbar Enterprises, these include Social House, Markette, Yogurtland, Karak House, Ethan Allen, Candylicious and Angelina. With recent launches of Gia, Cube and Garrett Gold and with more to follow, his market insight and hands-on approach make him as adept at managing franchise brands as he is at powering homegrown concepts to market success. Alongside numerous professional qualifications, Tyrone holds a Master’s Degree in Business Administration from the University of East Anglia and is a member of the Advisory Board for the Global Restaurant Investment Forum and the Global Restaurant Leadership Council. When not shaping exciting new concepts, he spends his free time with his family, playing golf and cycling.